I have a cake baking pans question. My aunt is a baker. She bakes all of the cakes in my family for various occasions. I am having my Wedding on 04.10.10. And I am having my aunt bake my Wedding Cake to save money. I have purchased 3 different sized pans for a 3 tier cake. The bottom pan is a 14x4 Square pan. The 2nd is a 10x4 round, and the last is a 6x4 round. I need to know what is the actual amount of ingredients needed for each size pan? She has her own recipe. She just needs to know how much to make for each pan? If you could answer this for me I would Greatly appreciate it! Simple question but not so simple answer. I am assuming that you mean how much batter per pan? With the 4 inch high pans I usually fill them 1/2 to 2/3 full. But it depends on the batter. For instance the carrot cake recipe I use is heavy and does not bake up well if too much batter is in the pan. A white cake may bake up fluffier and you could fill the pan to 2/3 full. So not knowing your aunts recipe, I can't really give you a definitive answer. 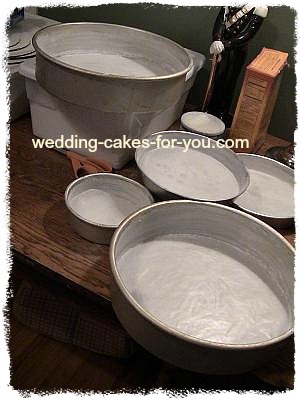 For a 14, 10, and 6 inch wedding cake, here is an example of a white cake recipe for a 3 tier wedding cake. I would suggest experimenting before the actual date. Your aunt may need to bake two individual cakes with the 10 and 14, 4 inch high pans for a two layer cake. You can probably get away with one 6 inch cake sliced into two layers. Wilton sells a heating core that you may want to try to assure even baking for your larger cakes. They also have a chart for batter amounts, but when if comes down to it you will need to adjust the amounts to your particular recipe.